Writing sql or any code is an iterative process. Most of the time that means to see what you have done say 5 minutes ago means how big is your undo buffer or better is if you are in SQL Developer there's a full blown history. If you are in sqlplus, you are basically out of luck. SDSQL has built in history and between sessions. We are still jiggling where it stores the history so from EA1 to next it's most likely going to change to be configurable and default to your PWD. That means a possible shared history OR a per folder history. If you type as little as possible like me, simply typing h will print the history upto the last 100 commands. Curious how many time a statement user executed? Try typing "history usage" and now it shows how many times with a number in parentheses. 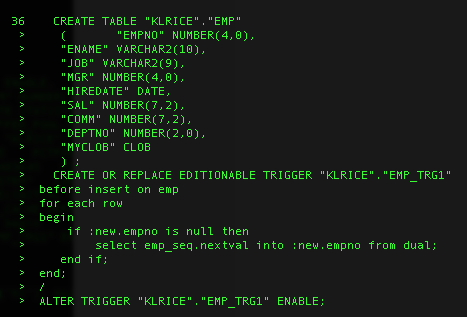 For example here, I forget a lot what emp looks like so I've done "info emp" 11 times. 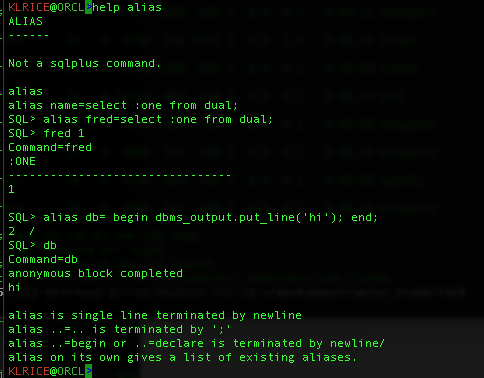 If you read my history, you probably noticed the alias command in here. Check out the help for it and give it a try.